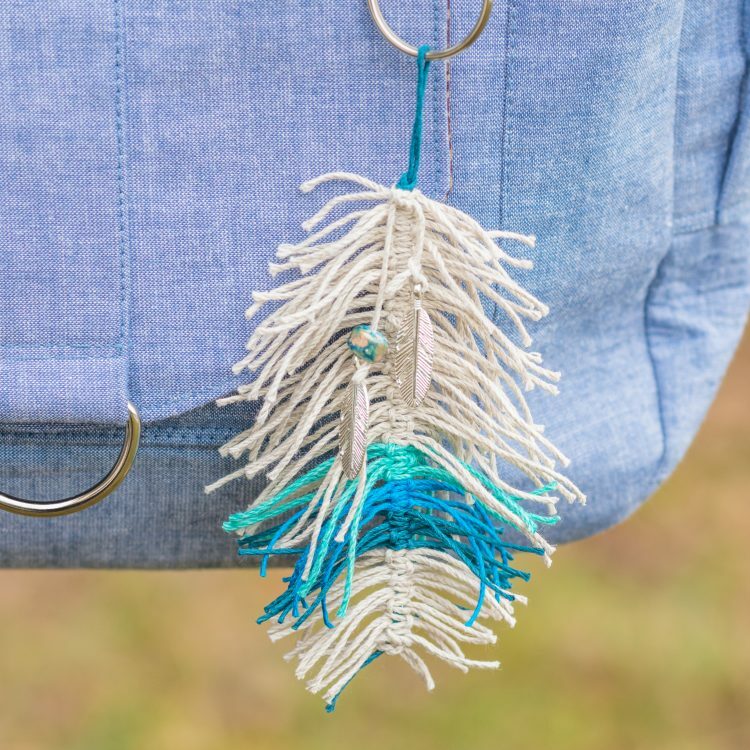 The feather bag decoration was made in exactly the same way as feathers from cotton macrame cord, but using hemp cord in natural, teal, turquoise and aqua this time. Because the twine used is so much thinner, it did take longer to do. 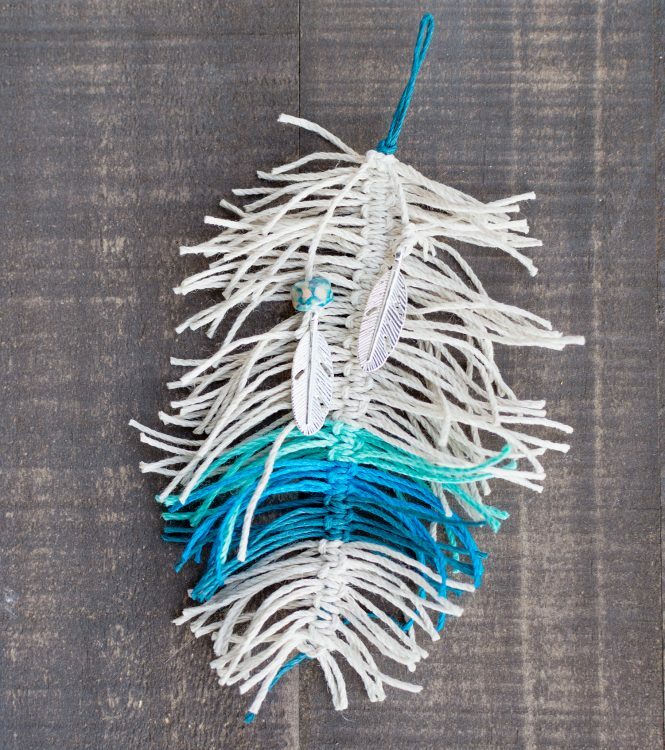 After trimming the cord into a feather shape (use a sharp pair of scissors for this), two feather charms and an aqua crow bead were added as an extra decoration. 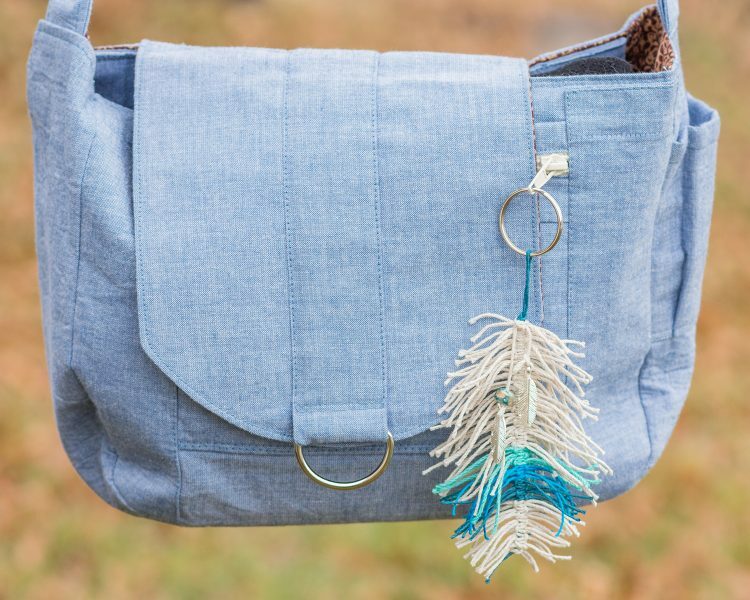 Add a bag pull clip to finish. *All items used are available from Hempbeadery. This is a macrame snowflake that anyone new to macrame can make – or someone who only knows how to tie a square knot. Plastic washers are inexpensive and can be found at the hardware store, we used a 1/2 inch diameter washer for the center of the snowflake. Start by cutting 18 lengths of cord approximately 28 inches long and attach to the washer with larks head knots. Using four cords at a time tie three rows of alternating square knots around the center. On the fourth row or layer of square knots add a seed bead to each of the next 4 cords and then tie two more square knots after the beads. On the 6th row tie one round of square knots leaving approximately 1/2 inch of cord either side of the square knot to ensure it lies flat. Tie three fairly tight square knots in line with the two flat knots above the last round. Tie an overhand knot at the end of the last four cords used for hanging up the snowflake. Trim the ends of the remaining cords and you are ready to hang the snowflake on your tree!